The Savannah Theatre opened its doors in 1818 with performances of 'The Soldier's Daughter' and 'Raising the Wind' and hosts a wide array of musical productions that come to the Savannah area. This is one of the country's oldest operating theatres and is located in the Chippewa Square area of Savannah, Georgia. The theatre was designed by William Jay, who also designed the Telfair Mansion in Savannah, which belonged to Alexander Telfair. William Jay is also known for having designed and built the Owens-Thomas House which, along with the Telfair Mansion, are both now National Historic Landmarks. Both of these wonderfully preserved locations also currently house museums that focus on the era in which they were built. The theatre has undergone different face-lifts, including a transition to its current Art Deco style as a result of the 1948 fire and has served as both a movie theatre and a live performance venue. The first renovation this theatre underwent was due to a hurricane on August 31, 1898. The hurricane tore sections of roof off and left severe damage to the structure of the building and flooded the auditorium. This gorgeous and historic theatre rests in the heart of the Savannah Historic District and is located just a short distance from other notable historic sites in the city. Being in the center of the downtown Savannah area, guests can find so many different attractions and tourist locations within walking distance to the theatre, providing a wonderful experience when visiting this beautiful city. Just a few of the stars that have performed at the Savannah Theatre include Oscar Wilde, Lillian Russell, Otis Skinner, Sarah Bernhardt, and W&period;C. Fields, among others. Edwin Booth, the brother of the infamous assassin of President Abraham Lincoln, John Wilkes Booth, was also a performer that worked this wonderful theatre. Booth performed a range of Shakespearean roles such as 'Hamlet,' 'Iago,' and 'King Lear.' One of the most notable performances to have taken place in the Historic Savannah Theatre was baseball star Ty Cobb in his role of 'The College Widow' in 1911. Located in the theatre lobby are several newspaper articles, artifacts, and photographs on display to detail the illustrious history of the theatre and how it came to be the beautiful building we see today! Viva Vegas! - During this nostalgic performance, enjoy creative and enthusiastic covers of songs from The Rat Pack, Elvis, Chicago, Earth Wind & Fire, Judy Garland and more from talented singers and some of the founders of The Fabulous Equinox Jazz Orchestra! Every singer that takes the stage is accompanied by a 9-piece orchestra that brings the classics to life! I Love You, You're Perfect, Now Change! - This comedic musical comes just in time for Valentine's weekend and will hit on some of the complications of loving each other! This performance will cover everything from the first date to the in-laws, and may have you wondering if they're talking about you by the end of it! 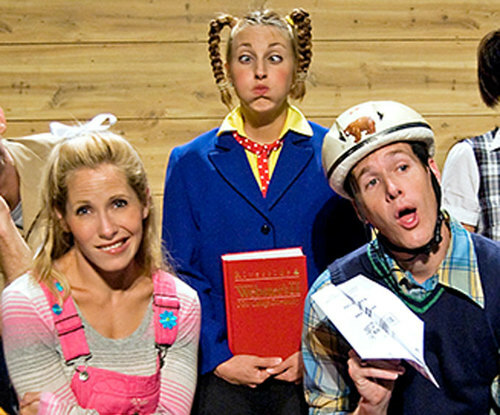 25th Annual Putnam County Spelling Bee - Join six tween spelling champions as they provide comedic relief in a 2-hour performance based on the book by Rebecca Sheinkin. Watch as they work their way through increasingly harder words while giving you a hilarious look at their vastly different home lives, and fall in love with the charm and character of this performance! Broadway on Bull Street - Listen to a variety of songs from all of your favorite Broadway musicals with this ode-to-Broadway on the Savannah Theatre stage! Some of the most beloved scenes and numbers from classical and contemporary musicals are featured in this 2-hour performance, so don't miss your opportunity to sing along to all of your favorites! Christmas Tradition Musical - This 2 hour Broadway performance is packed with all of the glitz and glamour of the holiday season and tosses in jazzy choreography, heart-wrenching stories of Christmas, a celebration of the Nativity, and comedic relief for a show you will never forget! This performance asks for a little crowd participation to create a truly unique Christmas experience for the entire family. Savannah Live! - Savannah Live is an energetic variety show that combines performances of Broadway, pop, Motown, and Rock'n'Roll music, and features a live band and eight talented singers rolled into a 2-hour show. Come out to the Historic Savannah Theatre and celebrate the performing arts in style! Book your reservations today and see what the Savannah performing arts scene has to offer! Includes admission to the Historic Savannah Theatre to see the Piano Men show. Historic Savannah Theatre : Savannah Live! In celebration of the Savannah Theatre's 10th anniversary, the "Savannah Live!" show was created. This dazzling, two-hour variety show will stretch across several genres, including as pop, rock and roll, Broadway, jazz, and country, in an unforgettable performance. The most fantastic shows and professional cast. Savannah is fortunate to have such a talented group performing in such a beautiful town. The historic theatre lends itself to a show you will never forget. All shows are quality entertainment. We can't wait for the next production!!!!!! This might have been the highlight of the trip. We debated about going back the next night when our ghost tour was cancelled. We loved being greeted by the cast at the end--sort of like a reception line. This is a must if you visit savannah. We were not expecting that level of professional musical performers. They were all very talented and provided a show with something for all music lovers. The performers made sure to connect with the audience. Big smiles and truly seemed to be enjoying performing. We had a wonderful time. The music was wonderful and we laughed so hard we had tears just rolling down our faces. I highly recommend it and will go again the next time we visit, because we will go again. We have a lot more exploring to do.